By Mary Anne Gourley - Convener, GSV British India Discussion Circle and FIBIS representative in Australia. The Queen's Own Madras Sappers and Miners Regiment. Illus. by Richard Simkin (1840-1926). Chromolithograph in Army & Navy gazette 1896. The East India Company established armies to protect its interests in India. Composed of European officers and soldiers, these regiments went out to India from 1748 and remained in the Company's employ until 1861, following the mutiny. The East India Company maintained an army in each presidency – Bengal, Bombay and Madras. Each army had regiments comprising European officers and men but they also established Native Regiments with European officers and native soldiers. 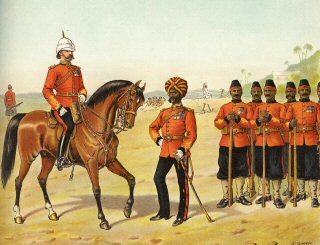 FIBIS - Families in British India Society - has an inclusive section on the Military in FIBIwiki covering all armies, their regiments, garrisons and history. The next meeting of the new British India Discussion Circle is on Tuesday 15 May at the GSV - see website for details. Read more about Did you have a soldier ancestor in India? Researching in British India - where to start? With the records of the East India Company, the India Office and the British Government now accessible without having to visit the British Library, the GSV has established the British India Discussion Circle. Its first meeting - for GSV members only - is to be held on Tuesday 17 April at 12 noon - 1.00 pm. The circle will be convened by Mary Anne Gourley, GSV Member and the representative in Australia of Families in British India Society (FIBIS). In this article Mary Anne introduces this area of family history with a brief outline of her own research. With some 3 million people of British origin having lived and worked in India between 1600 and 1947, many of us may find ancestors having connections to that country. How do we trace family who worked within the military, merchant navy, administration, commerce and trade in India? Can we unravel family stories of heroic soldiers fighting during the mutiny, of runaways, orphans and of course the inevitable and impossible to prove Indian princess! Where do we go to research these ancestors and what records will we find? For me, my research began twenty years ago with information recorded on the 1853 Victorian birth certificate of my great grandfather; his parents had been married in Calcutta and his mother had been born in India. By good fortune I was able to consult the Ecclesiastical indexes for Calcutta available on film from Familysearch. With information for that marriage in Calcutta, I was advised to order a copy of the document from the British Library in London, the repository for all East India Company and India Office records. 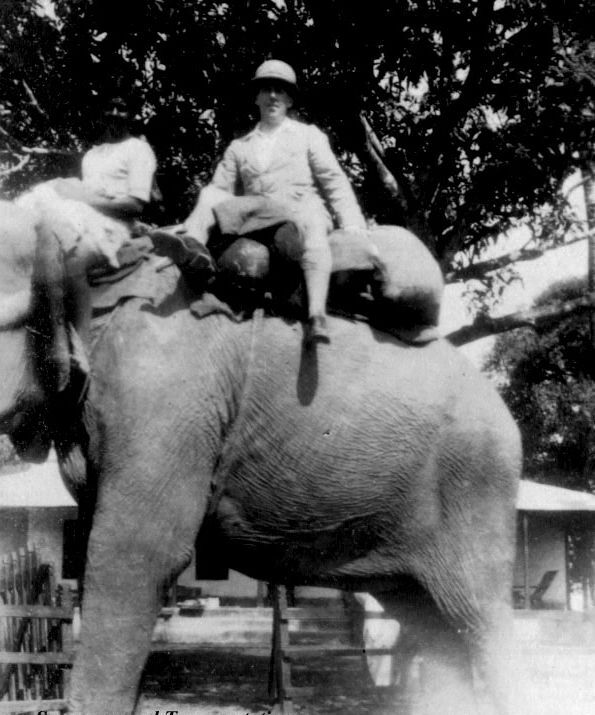 Dudley Gourley on an elephant c. 1927. Courtesy of Colin Gourley. This information has lead me on a forever expanding journey. I am amazed at the number of family members I have found in India; from cadets, soldiers and officers in the East India Company and British Army, merchants, planters, journalist, administrators. Many of them marrying and having families. Their stories reveal determination and hardship, tragedy and loss. Not all who survived remained in India. Many returned to the UK, a few came to Australia some travelled farther afield to Canada and South Africa. Interest in research in India brought about the founding of the Families in British India Society (FIBIS) twenty years ago in the UK. Technology has changed the way we research. Today it is possible to do our research using not only the resources held by the British Library in London, but those of other libraries and archives in the UK and worldwide with online databases. You can read more about this Circle on the GSV website. Read more about Researching in British India - where to start?